Clever die-cut pages and liftable flaps invite reader's participation in a handful of wild titles. 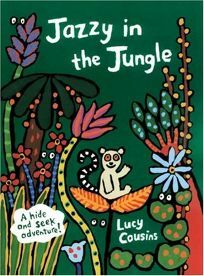 A baby lemur plays hide-and-seek with Mama Jojo in Jazzy in the Jungle by Maisy creator Lucy Cousins. Readers join the search, lifting layered, die-cut pages that highlight forest fauna and the peering eyes or other attributes of wild creatures. The polka dots on the stem of an exotic flower, for instance, become the markings of a caterpillar with the turn of a page. This oversize edition sports a sumptuous tropical palette; a final gatefold displays all the rain forest animals, who help to unite the mother with Baby Jazzy.